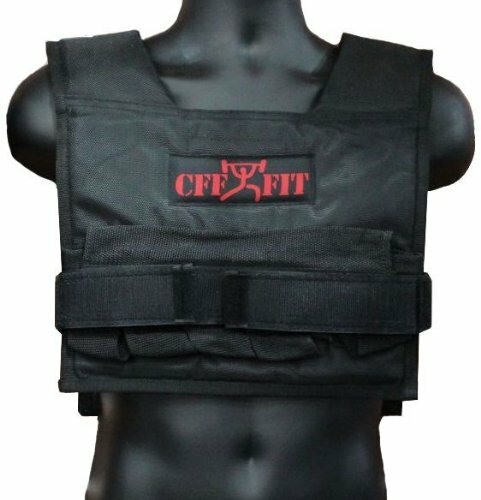 CFF 10kg Adjustable Weighted Short Vest (22 -Pound)Model: CFF-WVST-10Brand: CFF-FIT Your professional aid to success - CFF Vests are the Best vest with the best results. Weights are loaded at top body front & back for optimum performance. The vest is made of heavy-duty 1200D reinforced nylon, featuring double padded shoulders for added comfort and mesh vented inside for breath ability. The padding is designed to be contoured to your shoulder for maximum comfort. The CFF Weighted Vests are completely adjustable for even more comfort. There are two adjustable straps that can be adjusted underneath so you can easily adjust the body length of the vest by sliding the straps up and down through the D-rings. To adjust the weight level, remove or transfer the weights from the packets which secure the weights with the durable Velcro weight closures. Shipping is within the Continental US. The new CFF weighted vests are designed for all purpose training. For Firefighters training and CPAT exam simulation: For Trainers: Work out tool to any activity, indoors or outdoors For Runners: Wrestlers/Boxers/MMA training details at Sport Vest. Includes:(1) - 22 -Pound Weighted Short Vest; Weights included Color: Black Vest w/Red Logo. Great for Crossfit, Running & Fireman Training.